Moon said through his spokesman Thursday that he “cannot hold back outrage” as Lee accused the incumbent administration of taking revenge over the death of former President Roh Moo-hyun. Roh took his own life in 2009 amid a corruption probe into his family and aides during Lee’s presidency. “That isn’t something he can say as the president of Korea. It’s something he could say as former President Roh’s chief of staff,” Hong said Thursday. Moon had served as Roh’s chief of staff. Liberty Korea Party Floor Leader Kim Sung-tae said his party was deeply concerned. 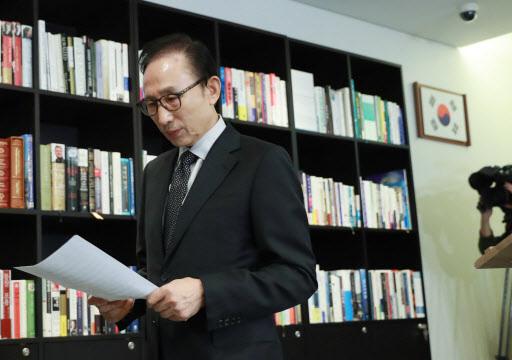 Choo Mi-ae, leader of the ruling Democratic Party of Korea, called on Lee to cooperate with investigations, saying his claims of a political revenge were farfetched. “It was a revelation by someone who worked for him faithfully for a long time, not political revenge from outside,” Choo said Friday, referring to Lee’s former private secretary Kim Hee-joong’s testimony against Lee. People’s Party leader Ahn Cheol-soo said Friday that Lee’s press conference Wednesday was a political trick to mislead the public. “He didn’t say a word about the facts regarding the suspicions raised against him, and only spoke about ‘annihilating conservatives’ and ‘political revenge,’” Ahn said. “If the Lee administration had serious problems, it is the role of the court and the prosecution to find out, not the president’s,” Yoo said in a radio interview Friday.